4-Word Review: Flying the unfriendly skies. 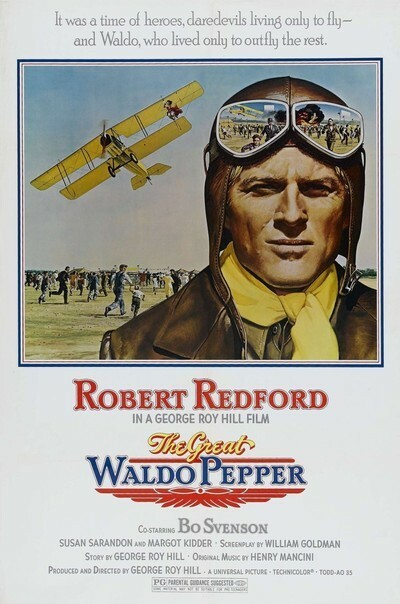 Waldo Pepper (Robert Redford) makes a living traveling the Midwest during the 1920’s and giving rides on his biplane to the eager public of the small towns that he goes through as well as doing airplane stunts at aerial shows. He misses his years during WWI when he was a fighter pilot trying to take on the German flying ace Ernest Kessler (Bo Brundin). Later when Pepper is grounded and can no longer fly legally he gets a job as a stunt man in Hollywood. It is there that he meets Kessler who is now working as a consultant on a movie about his flying days and the two agree to relive their war battle by having a duel to the death in the skies. The aerial footage is the film’s greatest asset and it is amazing particularly since the actors did all their own stunt work and without any type of protection. When we see actor Bo Svenson walk out onto the wing of the plane while in midair and even fall through it it’s all real and it makes you hold your breath. 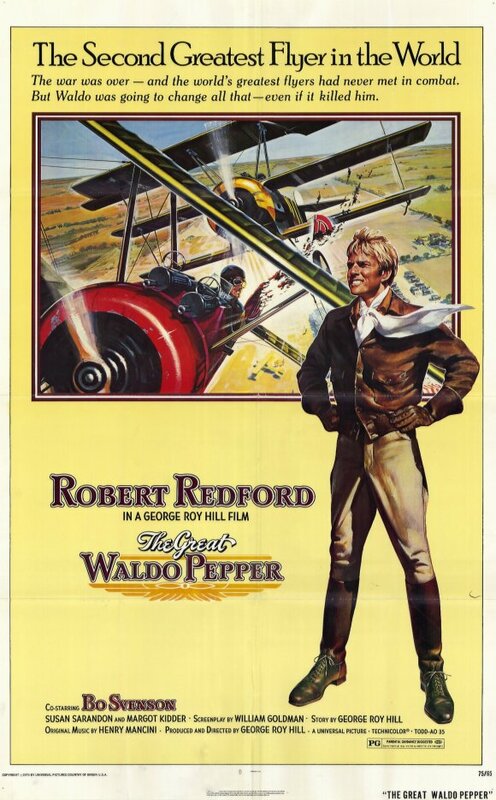 The scene where Redford flies his plane underneath another one in an attempt to save Susan Sarandon who has walked out onto the wing and then unable to come back is equally nerve-wracking. The film’s biggest fault and probably the reason why this big budgeted picture became an unexpected box office flop is because its unable to retain the breezy fun loving atmosphere of Redford’s and Hill’s two earlier collaborations. The film starts out amusingly enough, but then becomes quite serious when it features two deaths. The first one is good because it is completely unexpected and hits home the fact that stunt flying can have a dangerous side, but then the film has another death occur just 10 minutes later and it’s far more gruesome and drawn out while sucking all the lightheartedness out, which it’s never able to recover from. I’ve never been overly impressed with Redford as an actor. Sure he’s great looking and competent at times, but he always has too much of a laid back persona and unable to ever show any intensity even though he did manage to grow on me more as the film progressed. The supporting cast of Svenson, Philip Bruns and a young Susan Sarandon fare better and help keep the film afloat. 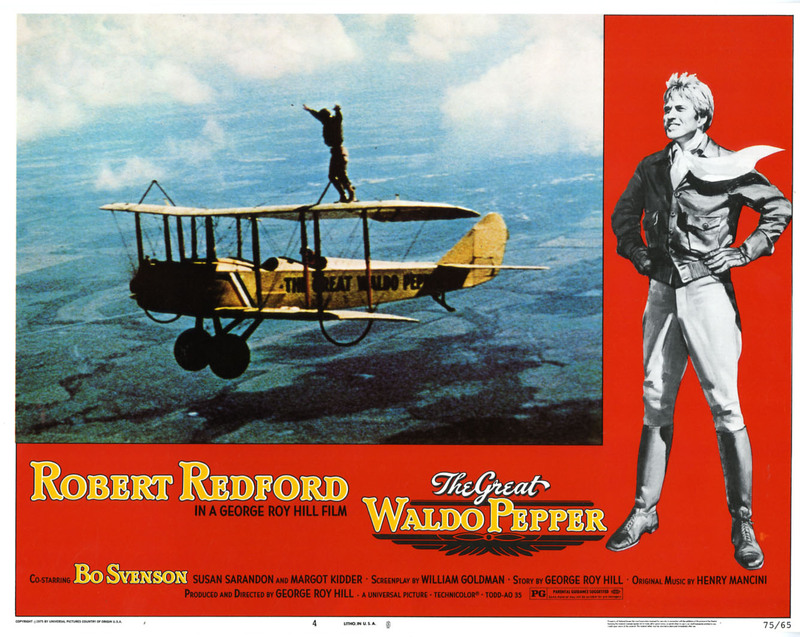 The third act where Waldo meets his idol only to find that the man isn’t quite as successful or exciting when he is on the ground as he was in the air is where the film gels as it makes some strong points about our culture’s need for hero worship and their climactic aerial duel is both thrilling and amusing.